After one has seen pines six feet in diameter bending like grasses before a mountain gale, and ever and anon some giant falling with a crash that shakes the hills, it seems astonishing that any, save the lowest thickset trees, could ever have found a period sufficiently stormless to establish themselves; or, once established, that they should not, sooner or later, have been blown down. But when the storm is over, and we behold the same forests tranquil again, towering fresh and unscathed in erect majesty, and consider what centuries of storms have fallen upon them since they were first planted, – hail, to break the tender seedlings; lightning, to scorch and shatter; snow, winds, and avalanches, to crush and overwhelm, – while the manifest result of all this wild storm-culture is the glorious perfection we behold; then faith in Nature’s forestry is established, and we cease to deplore the violence of her most destructive gales, or of any other storm-implement whatsoever. There are two trees in the Sierra forests that are never blown down, so long as they continue in sound health. These are the Juniper and the Dwarf Pine of the summit peaks. Their stiff, crooked roots grip the storm-beaten ledges like eagles’ claws, while their lithe, cord-like branches bend round compliantly, offering but slight holds for winds, however violent. The other alpine conifers – the Needle Pine, Mountain Pine, Two-leaved Pine, and Hemlock Spruce – are never thinned out by this agent to any destructive extent, on account of their admirable toughness and the closeness of their growth. In general the same is true of the giants of the lower zones. The kingly Sugar Pine, towering aloft to a height of more than 200 feet, offers a fine mark to storm-winds; but it is not densely foliaged, and its long, horizontal arms swing round compliantly in the blast, like tresses of green, fluent algæ in a brook; while the Silver Firs in most places keep their ranks well together in united strength. The Yellow or Silver Pine is more frequently overturned than any other tree on the Sierra, because its leaves and branches form a larger mass in proportion to its height, while in many places it is planted sparsely, leaving open lanes through which storms may enter with full force. Furthermore, because it is distributed along the lower portion of the range, which was the first to be left bare on the breaking up of the ice-sheet at the close of the glacial winter, the soil it is growing upon has been longer exposed to post-glacial weathering, and consequently is in a more crumbling, decayed condition than the fresher soils farther up the range, and therefore offers a less secure anchorage for the roots. It was still early morning when I found myself fairly adrift. Delicious sunshine came pouring over the hills, lighting the tops of the pines, and setting free a steam of summery fragrance that contrasted strangely with the wild tones of the storm. The air was mottled with pine-tassels and bright green plumes, that went flashing past in the sunlight like birds pursued. But there was not the slightest dustiness, nothing less pure than leaves, and ripe pollen, and flecks of withered bracken and moss. 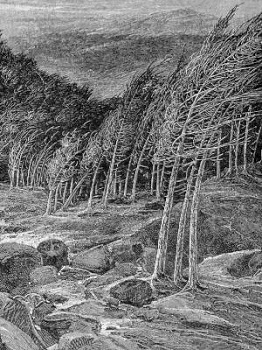 I heard trees falling for hours at the rate of one every two or three minutes; some uprooted, partly on account of the loose, water-soaked condition of the ground; others broken straight across, where some weakness caused by fire had determined the spot. The gestures of the various trees made a delightful study. Young Sugar Pines, light and feathery as squirrel-tails, were bowing almost to the ground; while the grand old patriarchs, whose massive boles had been tried in a hundred storms, waved solemnly above them, their long, arching branches streaming fluently on the gale, and every needle thrilling and ringing and shedding off keen lances of light like a diamond. The Douglas Spruces, with long sprays drawn out in level tresses, and needles massed in a gray, shimmering glow, presented a most striking appearance as they stood in bold relief along the hilltops. The madronños in the dells, with their red bark and large glossy leaves tilted every way, reflected the sunshine in throbbing spangles like those one so often sees on the rippled surface of a glacier lake. But the Silver Pines were now the most impressively beautiful of all. Colossal spires 200 feet in height waved like supple goldenrods chanting and bowing low as if in worship, while the whole mass of their long, tremulous foliage was kindled into one continuous blaze of white sun-fire. The force of the gale was such that the most steadfast monarch of them all rocked down to its roots with a motion plainly perceptible when one leaned against it. Nature was holding high festival, and every fiber of the most rigid giants thrilled with glad excitement. I drifted on through the midst of this passionate music and motion, across many a glen, from ridge to ridge; often halting in the lee of a rock for shelter, or to gaze and listen. Even when the grand anthem had swelled to its highest pitch, I could distinctly hear the varying tones of individual trees, – Spruce, and Fir, and Pine, and leafless Oak, – and even the infinitely gentle rustle of the withered grasses at my feet. Each was expressing itself in its own way, – singing its own song, and making its own peculiar gestures, – manifesting a richness of variety to be found in no other forest I have yet seen. The coniferous woods of Canada, and the Carolinas, and Florida, are made up of trees that resemble one another about as nearly as blades of grass, and grow close together in much the same way. Coniferous trees, in general, seldom possess individual character, such as is manifest among Oaks and Elms. But the California forests are made up of a greater number of distinct species than any other in the world. And in them we find, not only a marked differentiation into special groups, but also a marked individuality in almost every tree, giving rise to storm effects indescribably glorious. In its widest sweeps my tree-top described an arc of from twenty to thirty degrees, but I felt sure of its elastic temper, having seen others of the same species still more severely tried – bent almost to the ground indeed, in heavy snows – without breaking a fiber. I was therefore safe, and free to take the wind into my pulses and enjoy the excited forest from my superb outlook. The view from here must be extremely beautiful in any weather. Now my eye roved over the piny hills and dales as over fields of waving grain, and felt the light running in ripples and broad swelling undulations across the valleys from ridge to ridge, as the shining foliage was stirred by corresponding waves of air. Oftentimes these waves of reflected light would break up suddenly into a kind of beaten foam, and again, after chasing one another in regular order, they would seem to bend forward in concentric curves, and disappear on some hillside, like sea-waves on a shelving shore. The quantity of light reflected from the bent needles was so great as to make whole groves appear as if covered with snow, while the black shadows beneath the trees greatly enhanced the effect of the silvery splendor. The sounds of the storm corresponded gloriously with this wild exuberance of light and motion. The profound bass of the naked branches and boles booming like waterfalls; the quick, tense vibrations of the pine-needles, now rising to a shrill, whistling hiss, now falling to a silky murmur; the rustling of laurel groves in the dells, and the keen metallic click of leaf on leaf – all this was heard in easy analysis when the attention was calmly bent. After tracing the Sierra streams from their fountains to the plains, marking where they bloom white in falls, glide in crystal plumes, surge gray and foam-filled in boulder-choked gorges, and slip through the woods in long, tranquil reaches – after thus learning their language and forms in detail, we may at length hear them chanting all together in one grand anthem, and comprehend them all in clear inner vision, covering the range like lace. But even this spectacle is far less sublime and not a whit more substantial than what we may behold of these storm-streams of air in the mountain woods. We all travel the milky way together, trees and men; but it never occurred to me until this storm-day, while swinging in the wind, that trees are travelers, in the ordinary sense. They make many journeys, not extensive ones, it is true; but our own little journeys, away and back again, are only little more than tree-wavings – many of them not so much.